Nebraskaland! explores the lives and contributions of famous Nebraskans. The play takes place at a meeting of VIPs where Thrill America is unveiling plans for a new theme park, Nebraskaland! The audience is asked to help by choosing which famous Nebraskans will be honored in the park. Students will be introduced to Willa Cather, Malcolm X, Standing Bear, General Pershing, Father Flanagan, Grace Abbott, and many others. Written by Rose Playwright-in-Residence Brian Guehring. This show requires a 20′ wide by 15′ deep performance space. Main floor spaces that facilitate the load-in of scenery and equipment is appreciated. One electrical outlet is required. Actors need 20 minutes before and after the show for set-up and tear down. 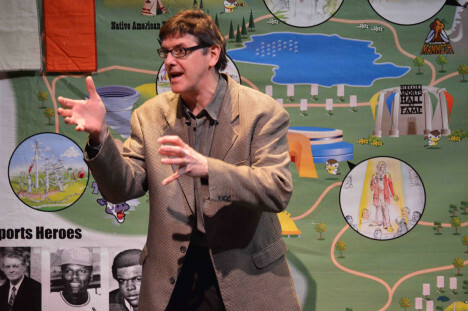 The Bully Show was selected for Kennedy Center’s prestigious New Visions/New Voices program. 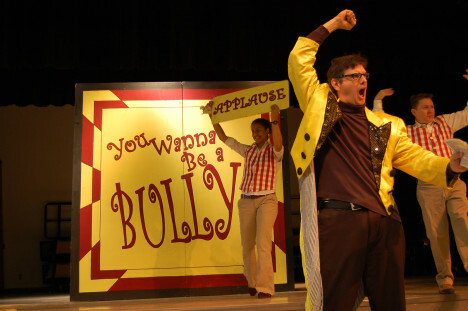 The play takes place at the taping of a new game show, YOU WANNA BE A BULLY!, with the kids acting as the studio audience and contestants. Tension between the host and his assistants increases as the game progresses and eventually leads to a surprise conclusion. 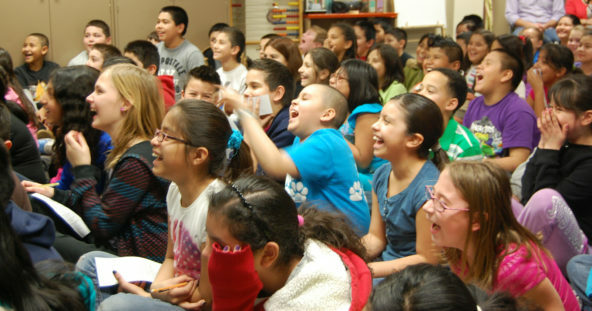 The Bully Show challenges students to reconsider their assumptions about bullies, victims, and spectators. Further discussion is encouraged. This show requires a 20′ wide by 20′ deep performance space. Main floor spaces that facilitate the load-in of scenery and equipment is appreciated. One electrical outlet is required. Actors need 20 minutes before and after the show for set-up and tear down. Standing up for others, respect for others, creating a safe space within a school, recognizing the signs of bullying and the steps to stop bullying. Developing active listening, understanding cause and effect, recognizing the ways people grow and change, recognizing consequences. The Mysterious Case Files of Silver Cash, Money Detective introduces the audience to Silver Cash, a fifth grade detective who solves kid’s money problems. In the first case, Sammy hires the detective to help her get more money out of her parents for the video game she wants. In the second case, the detective is hired to discover who stole the savings of a 4th grader. In the final case, Silver Cash has to take on the most important client of all as Silver tries to save money to upgrade his agency. The Mysterious Case Files of Silver Cash, Money Detective is a Theatre In Education (TIE) play. Theatre In Education combines theatrical elements with interactive moments in which audience participants work with actor-teachers towards an educational or social goal, using tools of theatre in service of this goal. The production of The Mysterious Case Files of Silver Cash, Money Detective (and any accompanying post-show workshops and study guides) will educate students about jobs and earning money, the importance of budgeting, how to save money, the difference between needs and wants, and comparison shopping. This show requires a 20’ wide by 15’ deep performance space. Main floor spaces that facilitate the load-in of scenery and equipment is appreciated. One electrical outlet is required. Actors need 20 minutes before and after the show for set-up and tear down. Financial literacy, earning money, budgeting, comparison shopping and needs vs. wants. Identifying story structure and elements of fiction, developing active listening, mathematics operations, problem solving, mathematics application. A ukulele playing lady is looking for someone with whom to make harmony. Who will it be? The shy recorder or the laid back drums? Dr. Kazoo, the uptight, member of the International Kazoo Quartet? What about Ms. Tambourine, an energetic dance teacher? 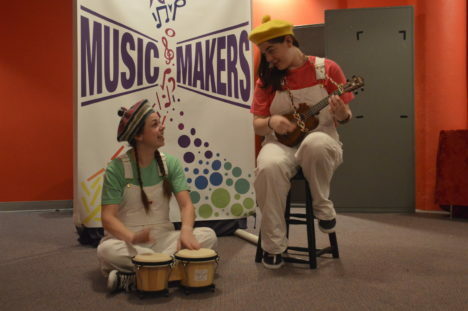 Featuring live music, The Music Makers tells the story of finding harmony even in surprising places. Music, loneliness, friendship, partners, collaboration.